Materials: Canvas, high quality oil or Acrylic colors. 100% handmade Original art oil painting. Beautiful Design with top quality. we use only ARTIST GRADE PROFESSIONAL oil colors and GALLERY HAND STRETCHED canvas to assure you always receive gallery quality artwork which involves actual professional painting. I can guaranty you will receive highest quality piece of art..
High quality 100% hand-painted oil painting on canvas provided by YaSheng Art. The painting is stretched onto a wooden stretcher frame, easy to hang.Please be noticed that the size of each painting is clearly shown in the pages, measure your area before purchase so that you can have an appropriate conception on the comparison of the painting size and your area. 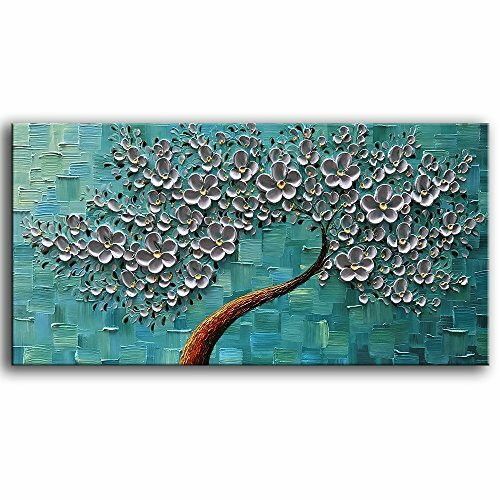 Each piece canvas painting is slight different in color tone due to being handpainted. Due to lighting effects and monitor's brightness/contrast settings etc, the color tone of the website's photo and the actual item could be slightly different. Hope you enjoyable purchasing ,Thank you very much! Size: 60x120cm (24"x48"inch ) All images on YaSheng Art store are real shot. Stretched and Framed decorative canvas oil paintings set for home decorations wall decor, each panel has a black hook already mounted on the wooden bar for easy hanging out of box. If you have any questions about this product by YaSheng Art, contact us by completing and submitting the form below. If you are looking for a specif part number, please include it with your message.